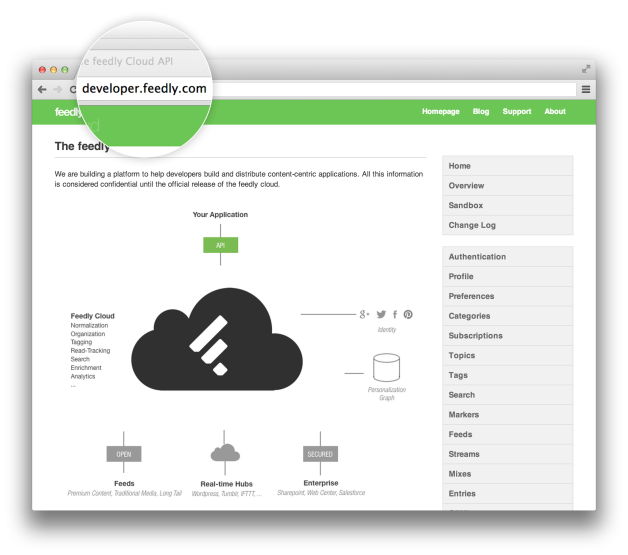 Feedly, the company that is arguably seeing the most success following the closure of Google Reader, has taken another big step forward in its development today by making its Feedly cloud API publicly available for all developers. In addition to including the data behind its users’ feeds, the Feedly API also includes a “powerful” personalization graph and powers its apps across all platforms, the company says. More specifically, that gives developers a chance to use categories, feeds, topics, tags, mixes and more to develop applications and services that really bring RSS to life. Feedly has worked hard to develop its own back-end after being reliant on Google Reader, like many other RSS services, for so long. It launched its cloud platform in June, when it also unveiled a one-click migrant for former Reader users. The Feedly cloud API actually powers all of the company’s services, right from its basic service, to article search and other features from Feedly’s Pro subscription tier — which launched last month, and costs $5 per month — giving developers plenty of scope to build their own offerings. There are already 50 Feedly apps — including services from the likes of IFTTT, Reeder, Sprout Social and others — and we can expect that figure to grow rapidly as more developers embrace the API. You can find it at developer.feedly.com. Feedly had 4 million users prior to Google’s big announcement, but that number tripled to 12 million users, as of the end of May.